A Glossary is a collaborative activity in which instructors and students can create a list of concepts and their definitions. Entry pages for concepts can contain formatted text, images, and attached files. Participants can provide comments and rate individual entries, turning the glossary into a graded assignment activity. For instructions on adding a glossary to your course, see Moodle 3: Activities & Resources: Add a Glossary. In the General settings, the instructor can designate a title and provide a description or instructions for the glossary. The instructor can also designate the type of glossary: main or secondary. A main glossary is a glossary in which entries from secondary glossaries can be imported. There can only be 1 main glossary in a course. If the instructor does not plan to import entries, all glossaries in a course can be set as secondary glossaries. Autmatically link glossary entries: If site-wide glossary auto-linking has been enabled by a Moodle Administrator and this setting is enabled, the "Add a new entry" form will include the option to automatically link the entry wherever the concept words and phrases appear throughout the rest of the course. Instructors can grade glossary entries by setting up the Ratings options. Entries use a rating scale which you can customize. The aggregate type is how all the ratings are combined to form the final grade. If a Point Scale is used (recommended), the Maximum Grade should be changed to reflect the scale (0 to 5, for example). Instructors can also Restrict ratings to items within a specific date/time range. For example, only glossary entries made by the deadline will be rated if this setting is enabled. The Glossary activity can be restricted based upon a date, group, activity completion of another activity/resource in the course, etc. NOTE: If more than one restriction is added, students must meet EACH of the requirements before the Glossary becomes available. 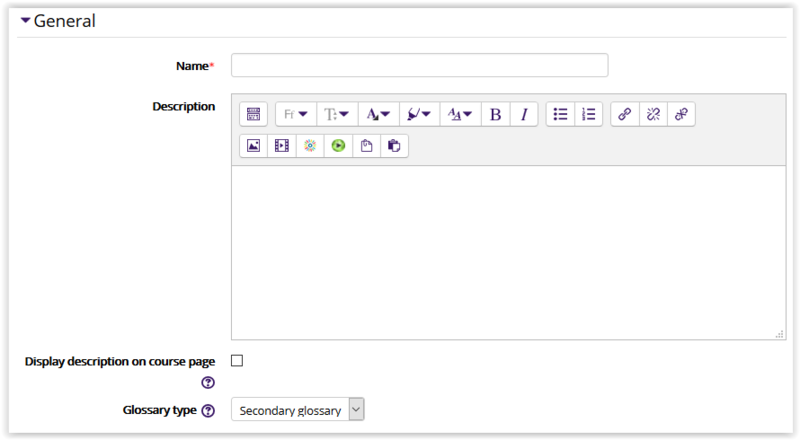 By default, students can manually mark the Glossary as complete, but an instructor can change this to be required. If required, the students can be marked complete by viewing the activity, receiving a grade, and/or creating a specific number of entries.